I’ve had a very interesting photographic career. Even though for two decades, I shot food for advertising and other commercial assignments, I was fortunate to simultaneously pursue photojournalism while serving in the U.S. military. After looking at my blog, one of my Army buddies asked me where were my PJ shots? Good question, since more than half of my 22 years of military service was as a photojournalist. Even though I’m posting an image today, I may very well devote an entire page on this site to some of my more memorable PJ shots. This diptych comes from my last tour-of-duty in the República de Panamá. We were based at Santiago, in the Provincia de Veraguas, which is located in west-central Panama; roughly a 6 to 8 hour ride on an old school bus! My best friend, Koby, and I were sent to the north-western corner of the province, in the mountains up near Provincia de Bocas del Toro, to provide newspaper and TV coverage of humanitarian work by U.S. Army National Guard engineers. They were rebuilding a clinic in a small mountain village. Our only access to this hinter region was by air, so we hitched a ride with a flight of Vietnam-era Huey’s from the Illinois Army National Guard. After completing our mission, our flight decided to practice “nap-of-the-earth” flying along the Río de Jesús, which had a real pucker factor, but that’s another story for another time! 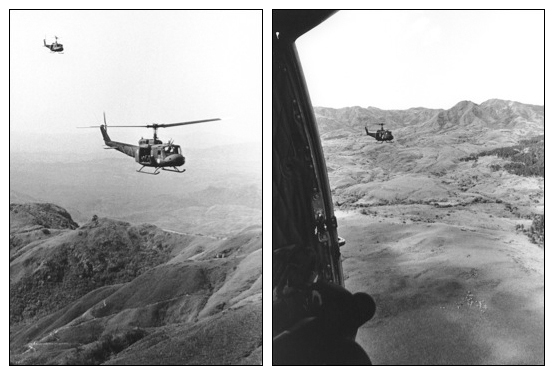 © 1992 Terry Ownby, Huey’s flying along foothills of the Ande’s in western Panama.